On First Take Fridays a number of authors around Meeple Mountain give short first takes on games that are new to us. This week we have takes on Spirits of the Forest, Reykholt, Architects of the West Kingdom, and Codenames: Harry Potter. 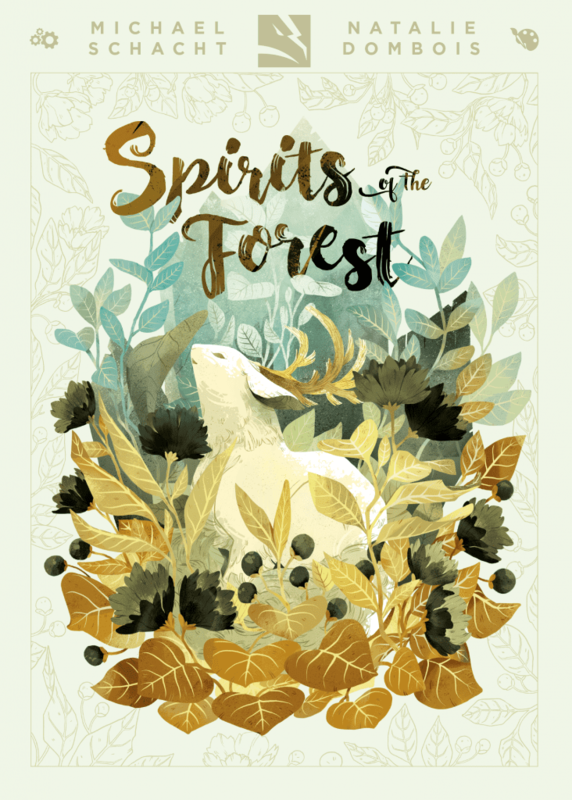 Spirits of the Forest is a gorgeously illustrated game from Thundergryph Games and designer Michael Schacht. I couldn’t help but back it on Kickstarter based on the price, the artwork from Natalie Dombois, and the simple gameplay. It raised over $400,000 in January of 2018 and landed on my doorstep at the beginning of October. In Spirits of the Forest players are collecting 10 different spirits from a central playing area. Each spirit tile has a value on it and one or two icons. Players receive points for collecting the most of each spirit, and lose points of they don’t have at least one of a spirit. Players additionally receive points for having the most of each various icon type. I was really eager to get and play this game as I knew my kids would love it. Spirits of the Forest is easy to teach, quick to play, and offers some really fun tactical choices. The tiles are shuffled and placed in the middle of the table; and since you can only select tiles from the ends of the play area you have to constantly be looking ahead to what might be available on a future turn. It’s a fast game, perhaps 20-30 minutes, and a light, sweet filler between heavier games; or a perfect lunchtime game with your coworkers. Check out this great 2 player walk through video of Spirits of the Forest from James Hudson, of Druid City Games, and his son Parker. Read more from Andy Matthews. I don’t like to use the word “hate” to describe how I feel about anything… but I hate Uwe Rosenberg’s At The Gates of Loyang. I was excited when I first heard about his new game, Reykholt, where players farm vegetables in Iceland using greenhouses and geothermal energy. Then I found out it was similar to At The Gates of Loyang and all that excitement and anticipation disappeared rather quickly. Reykholt is a pretty standard Rosenberg worker placement game that is played over 7 rounds, consisting of 4 phases. In the first phase of a round, players use their workers to get greenhouses and vegetables, plant seeds, and harvest early. During the second phase, each player harvests one vegetable from each of their greenhouses. The third phase, Tourism Time, is where players will spend vegetables to progress on the tourism track. This is important because the player the furthest ahead on this track at the end of the game will be the winner. At first, players will be required to give up a single type of vegetable to move ahead, but further down the track, they’ll be required to spend 2, 3, 4, 5, and even 6 vegetables of a single type at once just to move one space. The final phase, Homecoming, is where players cleanup and prepare for the next round. Early in the game, I noticed that Reykholt was much less restrictive and more forgiving than At The Gates of Loyang, especially since you can generally accomplish what you need to even if someone gets in your way. It’s because of this that I really enjoyed playing Reykholt. Just because this is a lighter Uwe Rosenberg worker placement game doesn’t mean that the meaningful decisions are lost. In later rounds of the game, it takes a lot of careful and clever planning to be able to progress on the tourism track. 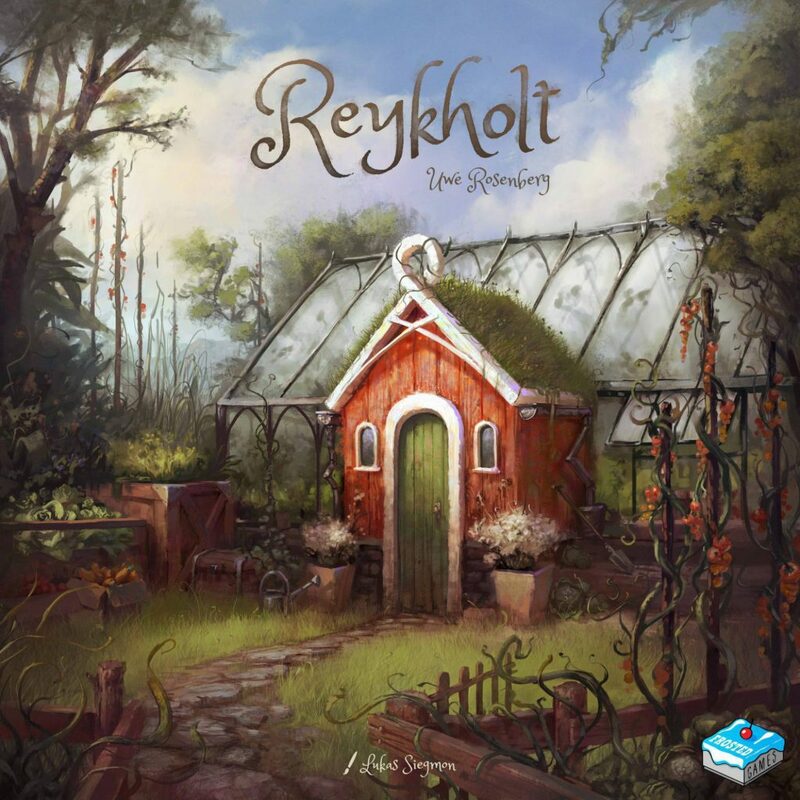 Reykholt was a wonderfully pleasant surprise and I’m looking forward to jumping into another game of it and maybe adding the scenario and event cards from the included Story Mode. About a year ago, I had the great fortune to run into someone that owned Raiders of the North Sea. A little over an hour later, I was hooked. I’d never really heard of Shem Phillips at the time, but I became an instant fan. 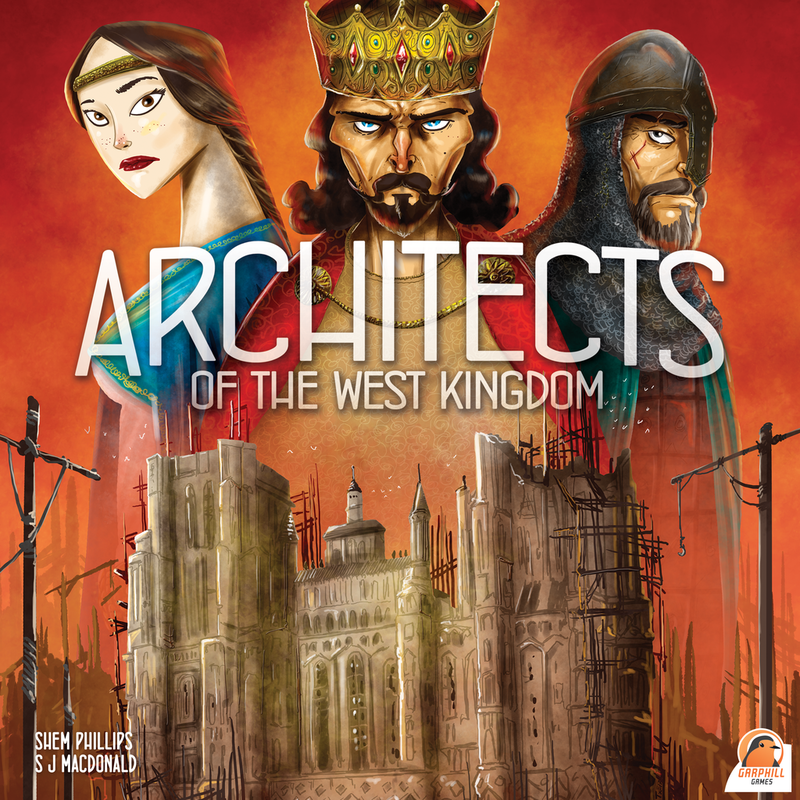 That is why I backed Architects of the West Kingdom without any hesitation when it hit Kickstarter earlier this year. In Raiders of the North Sea, he managed to put an interesting spin on the worker placement mechanic by having you place a worker onto a space to take an action and then picking up a different worker from an occupied space in order to perform that action. This created a lot of situations where you’d want to take an action, but you purposely wouldn’t because doing so would create opportunities for your opponents. In Architects of the West Kingdom, Shem Phillips turns this mechanic on its head once again with very interesting results. On the surface, Architects is nothing new. It’s a game about using workers to collect resources to build things in order to score victory points. It’s the way that the game treats worker placement that makes it something exciting and unique. In Architects, you place one worker at a time onto a board location, but the rewards that you reap become bigger and better the more workers that you already have at that location. Each player begins the game with 20 workers and while this seems like a lot, it quickly becomes evident that it really isn’t because one of the actions on the board allows players to collect groups of workers from the board to hold them captive. These workers can later be sent to prison where they will earn their captors valuable coin. Of course, they could always choose to collect their own workers from the board instead. This is what really makes this game intense. You’re always having to weigh the benefits of getting more versus the potential of your opponents to drastically reduce your workforce. I love Shem Phillips and I think that artwork by The Mico only serves to make things even better. I really enjoyed my first playthrough of this game. However, I could see this not hitting the right notes for a lot of other people. Aside from the intriguing worker placement aspect, there’s nothing much new under the sun in this game. It’s pretty standard euro-game fare… and that’s perfectly fine by me. Codenames took the board gaming community by storm and quickly became the quintessential party game for gamers. Since the original hit game, Vlaada Chvatil and Czech Games Edition have pumped out Codenames: Pictures, Codenames: Marvel, Codenames: Duet, Codenames: Disney, and Codenames: Deep Undercover but none of those really got me excited beyond the original. Enter Codenames: Harry Potter. I grew up reading and loving the Harry Potter series and I’ve been waiting for and wanting the perfect Harry Potter game. Hogwarts Battle was a decent deck building game, but the theme is what kept me playing, not the gameplay. 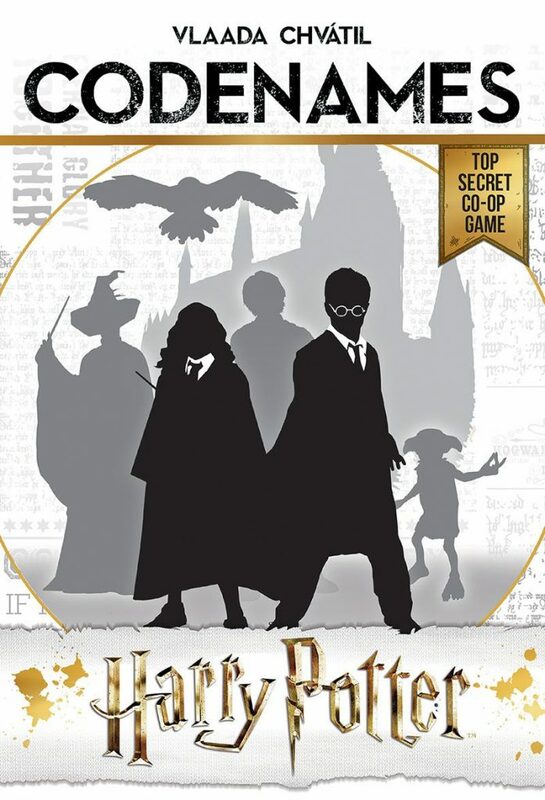 Codenames: Harry Potter took the two player game system from Codenames: Duet and replaced all of the cards with spells, places, and magical objects from the Harry Potter universe and the reverse side of the text are photos corresponding to the same words. After one sitting, this has easily become my favorite edition of Codenames. Taking the ideas from my favorite IP and forcing me to find the links between them was a more interesting puzzle than I initially anticipated. Every now and then, you’d get a perfect, simple clue that linked together multiple words and that was rewarding, but more often then not you’d find that perfect clue pulling together multiple words but then you’d find a separate word that throws off your plans. Since all of the words are from the same thematic universe it is both easier to find clues that join them, but harder to find ones that are unique to your message. That dynamic and forcing myself to dig deep into my Harry Potter knowledge to unlock the perfect clue is what makes this stand out to me. Read more from Andrew Plassard. I like big games and I cannot lie, you other gamers can’t deny. That when a euro walks in with a shiny new case and a rule book in my face, I get pumped. Hi I’m Andrew and I like heavy euro games with a side of player interaction when necessary. I think board games are the best way to force me to think in different ways while having fun and hanging out with my friends.